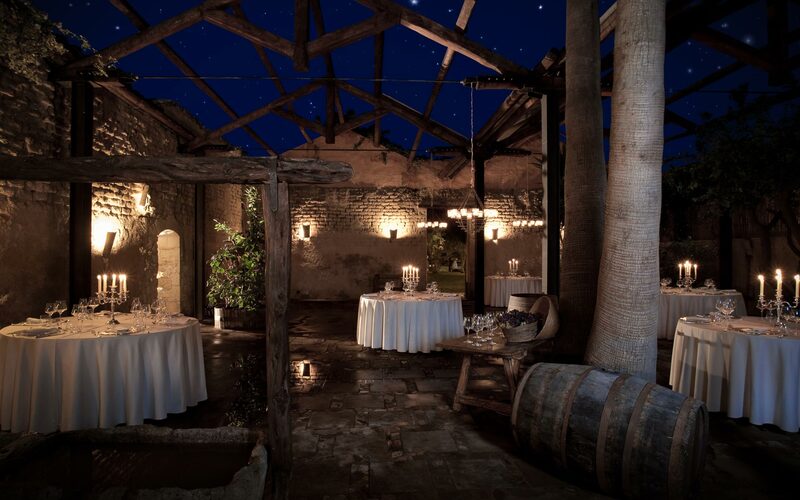 The social dinner will be hosted at the “Convento di San Giuseppe”, a medieval church adapted as a monastery in the 17th century and now a beautiful location where it is possible to taste traditional and innovative dishes of the Sardinian cuisine. At first, the social dinner location was “Santa Maria delle Vigne”, a small Medieval country church, at the time of the feudal Giudicati kingdoms. The Vittorini monks turned it into a convent devoted to prayer and agricultural labour. Later, in the XVII century, the Scolopi Fathers consecrated it to Saint Joseph Calasanz. In the XIX century it became the property of the family who still owns it today and for more than a century, it was still devoted to farming activities a the gates of Cagliari, until the city expanded and engulfed it. More than twenty years ago, after a careful and loving restoration, it was reborn as a place to welcome, meet and celebrate. 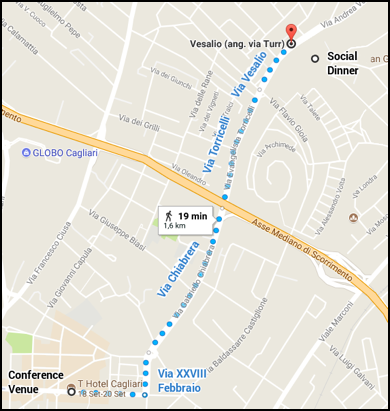 The restaurant will open the secondary entrance in Via Vesalio 3, which is easier to reach both on foot and by bus and it is not listed in Google Maps. Go to the Piazza Giovanni XIII bus stop. Having the hotel at your back, turn left and go straight. Turn right onto Via delle Medaglie D’Oro. Take the Line 1, direction Flavio Gioia. There is a bus about every 10 minutes. Stop at Vesalio (ang. Via Turr) (14 minutes, 13 stops). Cross the street, the entrance is in front of you. 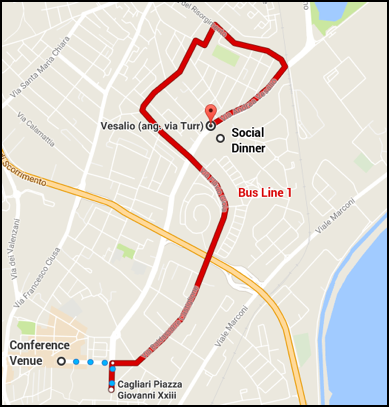 For going back, take the bus at the same stop, it will take you back to Piazza Giovanni XIII. You can buy the bus tickets in the automatic machine in Piazza Giovanni XIII or in any shop displaying the following symbol. The company name is CTM and the ticket costs 1.30 euros. Pass under the overpass, the street name changes in Via Evangelista Torricelli. You will find the entrance on your right (n. 3).